The Health Benefits Of Chocolate | PrimeYours! Chocolate is one of the most popular treats for people all around the world. And, at certain times of the year such as Christmas, Halloween and Easter, the amount of chocolate on the market increases significantly. For many people, trying to eat healthy and maintain a healthy lifestyle means that they can’t indulge in these sweet chocolate treats. But the idea that chocolate is bad for you and will make you fat and pimply might be wrong. This is great news for anyone who loves their chocolate! Dark chocolate is an antioxidant, and if you are wondering what that means, you are not alone. Here’s the deal on antioxidants. They are organic substances that can help guard the body from the dangers of “free radicals” which can damage cells and cause diseases. Studies have shown that antioxidants are helpful in preventing certain diseases such as cancer and heart disease. Dark chocolate is high in flavonoids which are natural antioxidants. White chocolate, on the other hand, has no flavonoids. Other foods that have similar antioxidant levels include green tea and fruits such as raspberries and pineapples. Is Any Chocolate Good For You? Unfortunately, not all chocolate offers the same health benefits. So, scarfing down a box of chocolates is not going to mean that you have added years to your life. Instead, the benefits of chocolate come from dark chocolate, not white chocolate or milk chocolate. According to medical opinion, it is dark chocolate that can help lower your blood pressure. Apparently milk prohibits the absorption of antioxidants which explains why milk chocolate, as opposed to dark chocolate, is less healthy. Dark chocolate contains more cocoa, which is where the nutrients come from, and less sugar than milk chocolate. Some patients who have high blood pressure have been advised to eat a bit of dark chocolate every day to lower their blood pressure. As great as this medical treatment sounds, remember that it also means that the calories you consume eating this chocolate have to be balanced with other foods in your diet. So, balance a dark chocolate bar with other foods that don’t similar nutrients and calories. Do not simply eat as much dark chocolate as you can get your hands on – moderation is still the key. Dark chocolate is good for a number of reasons. First of all, it’s lower in calories than its counterparts, white and milk chocolate. And, it contains several different nutrients, such as iron, potassium and vitamins A & C. Plus, cocoa is high in magnesium which can help you maintain a healthy heart and helps your body absorb other minerals like calcium. Chocolate is also good for your cholesterol, believe it or not. It does not raise your bad cholesterol levels, and according to the science of it, the cocoa butter in chocolate contains a type of fat similar to that found in olive oil – this may, in turn, help to raise your good cholesterol levels as well. Chocolate can also improve your mood. While this isn’t a physical health benefit, science shows that the chemicals found in chocolate can help one’s brain produce a chemical that is usually produced in response to feelings of joy and happiness. Plus, just the smell of chocolate can make people more relaxed. Contrary to common beliefs, chocolate is not a significant source of caffeine. Unlike coffee, the amount of caffeine in chocolate should not result in nervous excitement or jitters. It just does not contain enough caffeine for this to happen, so you should not worry about this unless you have been advised to remove all caffeine from your diet. If you were to tell someone that you were on a diet and that you consumed chocolate daily, they would laugh at you. This is because we think that chocolate is always bad for you – it’s high in saturated fat and sugar – so how could it possibly be on your diet menu? Well, the key is moderation. Choosing to have a few squares of dark chocolate will result in all the benefits mentioned above. Plus, you won’t feel deprived which means that you will be less likely to over-indulge in a moment of weakness. 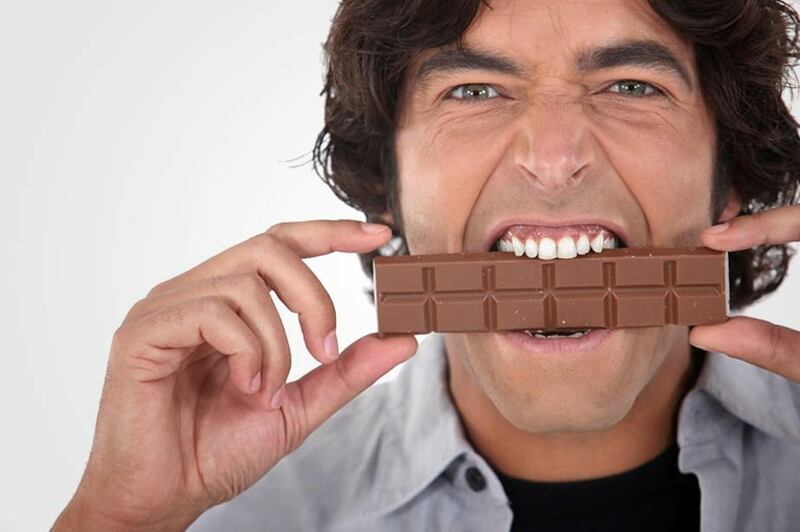 If you have a sweet tooth and are apt to indulge in sweets, then there’s more good news – chocolate is better for your teeth than other sweet treats. This is because it stays on your teeth for a shorter period of time than other sweet things which means there is less opportunity for bacteria to form and rot your teeth. Also, as mentioned earlier in this article, the smell of chocolate can also help relax people by stimulating the brain. So, instead of eating too much chocolate, indulge in some chocolate-scented aromatherapy which can help relax and improve your mood. Now that you know a little more about the health benefits of chocolate, you can get started on improving your health while indulging in a little sweet treat every day. A good way to ensure that you don’t over-indulge is to buy small-sized portions of chocolate. Halloween-sized treats are perfect for this but unfortunately, those treats are primarily milk chocolate candies that are high in sugar and saturated fats. But, small-sized treats are perfect for a quick snack at any time of the day and because they are small, you won’t be tempted to eat more than you should eat! Remember, when shopping for chocolate, try to get dark chocolate only because that’s where the antioxidants are.